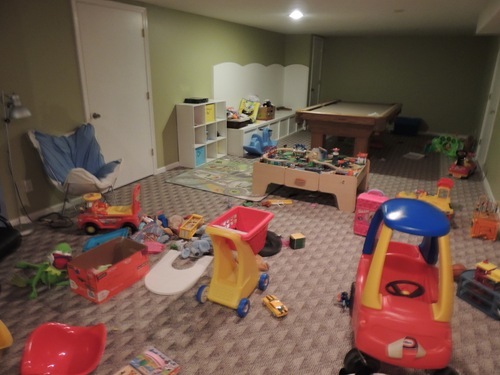 Awhile back I wrote about the state of my basement. When the kids play down there they leave it such a mess that they don’t want to play down there again. 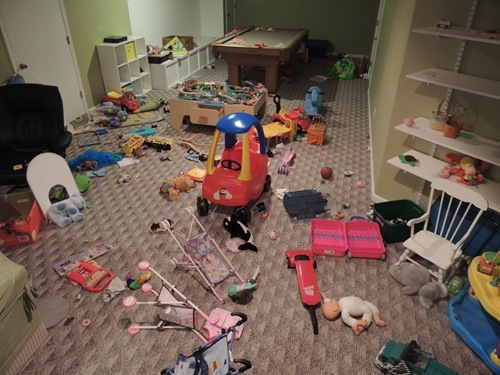 I tried encouraging them to clean it, but Gabbie told me that if I don’t organize it for them, they can’t clean up. Okay then. Today I decided to get on top of that organization she suggested. Or at least to start. We have a large basement so I decided to work in sections. I started with the left side working from left to right across the room. The other half will come later. The following is what this part of our basement is “supposed” to look like. Well, it’s what it looked like 3 years ago when we first moved in! So not everything was unpacked and what was hadn’t been played with at all. As you can see, I’m nowhere near finished (although I did take these photos before doing a bit more), and there’s still the other side to tackle. I did start over there actually, but I’m taking a break. The worst part has been finding these huge bugs – I think they are crickets?? which are so thankfully not living. But they are so large and plastic looking that they almost look like toys. 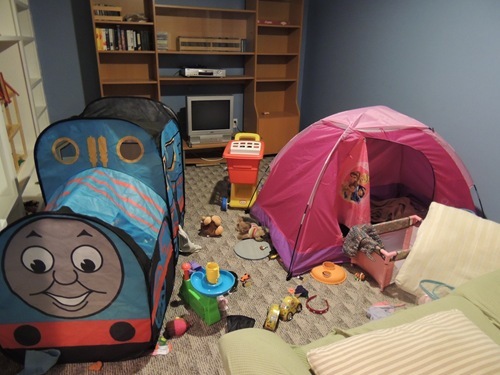 Which scares me even more, because what if my kids tried to play with them? EW! I spent a bunch of time with our train table because we have the type where the tracks only fit onto the table in one formation and while my kids tend not to take them apart, we have had lots of visitors who have. I’ve been wanting to glue down the tracks for awhile now and finally did so today. I also glued back together the train station, airport, some of the light poles, etc. I am hoping the train pieces will stay where they belong now. One thing that still needs a solution is all of our stuffed animals. I put them into boxes on the long white built in piece on the left of the pool table in the pictures above, but they are stuffed in so well that those on the bottom can’t be seen. I am sure they will either be pulled apart and spread around the room, or the bottom animals won’t be touched at all. Originally (top picture) they were all spread out on top of the built in and I wonder if that’s the way to go back to. A lot more toys are still needing to be put into their places and organized. 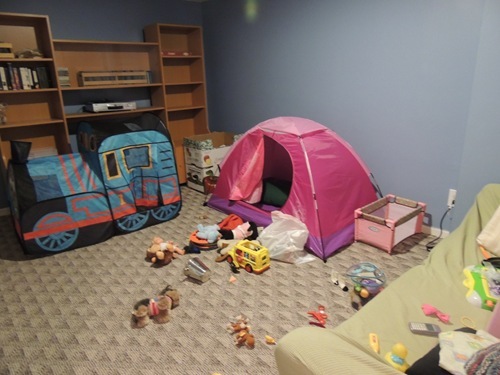 I am hoping I’ll be able to tell what toys aren’t used at all by those that stay in the same places where I put them! And maybe my kids will learn to clean up. But first I have to finish my part – they can’t clean up until I organize, didn’t you know that?